Parippu Moloshyam / Simple Dal Curry | Simple and Delicious ! 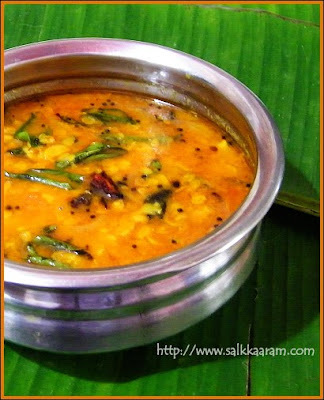 Moloshyam or moleshyam or mulakashyam/mulakushyam is a simple dal curry prepared in most of the keralite homes, especially when there are no fish or veggies, or vegetarians cook this much in many days of the month since it is a simple perparation.The method of cooking varies in each region, some add tamarind, others add only tomato.. Any way the the curry would be little running / thin and is usually taken with hot rice! Soak dal / tuara parippu in water for 1 hour. Chop onion, tomatoes and green chillies. Soak tamarind in water and take the extract. Pour water enough to cook dal in a pan / pressure cooker. Add dal along with onion, tomato, greenchillies, tamarind extract and the powders. Add salt and cook until the dal is done. Crush garlic, shallots and break redchillies into pieces. Heat oil, splutter mustard seeds, fry curry leaves and crushed ingredients and dry chillies. Saute until the shallots are little brown, pour this seaoning over the curry. My dad was in Army too but not in Indian Army! 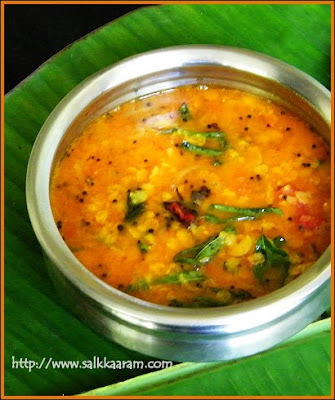 I imagine the cocon oil enhancing this simple dhal to whole new level! very happy to read about your MOLOSHYAM. while reading this i went to my childhoo. i was in the boarding school from 1st form to 6th form. those days i had lotz of stomach issues and i used to see one of our teacher takes always MOLOSHYAM especially during dinner. i never knew this before. about this product. i hail from cheruvathany, 3 km west of kunnamkulam. we never had a dish like this. when i told about my issues to sankunny nair and chief chef gopalan nair, he told me to have moloshym in the evening food. first few days i did not like moloshyam, later i could not avoid this whole time of my study life there. now i have to take a print of this recepe to my partner beenamma and ask her to make this evening. thanks a lot seena jee to publish such a lovely and wonderful dish. I too prepare this same parippu curry! It was nice to read the story behind! Seems simple, but u didnt' mention at which point should we add the tamarind extract....before or after the dal is cooked? Thanks for posting all the wonderful dishes,especially the "nadan" simple,easy & tasty ones.They are of great help to working women like me. Iyoooo kothiyavunnuuuu adipoli....Parippu looks deliciou dear. this looks delish seena. What dal did you use? I really admire ur site.I am always a regular and silent visitor of ur blog.Tried most of ur recipes many times and came out very very well.Thanks for all ur efforts. Now I have to ask you one doubt.A food processor or mixer what will be a good choice for a family of 4 members?Which is the good quality food processor/mixer availabe in India?Please help. I think a good mixer grinder will be enough for your family. For mixer grinder check this link and read comments. I use a braun food processor which is very very good, which do lots of works! And mixer grinder I have one black and decker with three jars, which really grinds well. But don't know it is available in India. Wooow.....ea, i lovewd teh photograph...it i ssooooper.....we prepare the same curry, but we call it parippu curry....lol...my mom sometimes add potatoes to this and we dont add tamarind...I make this on a laaaaaaaazy days lunch!